PROSSER, Wash. – Washington’s modern wine industry can trace its roots back to 1962, when a group of University of Washington professors launched Associated Vintners. It was the first winery in the state to focus solely on wines made from European (vinifera) grape varieties. Now the son of one of those men is on a quest to turn the state’s wine industry into one that is more environmentally friendly while also creating a line of delicious gourmet products. Eric Leber and Lori Ramonas are the owners of AprèsVin, a small company that transforms hundreds of thousands of pounds of Columbia Valley wine grape seeds into fantastic oils and other products, all while reducing the tremendous amount of waste byproduct into something useful and beautiful. We recently traveled to the tiny Yakima Valley community of Whitstran to see the operation in action and to chat with Leber and Ramonas. Leber’s father, Ted, was one of the original founders of Associated Vintners – and he’s one of three still alive. They began their quest for world-class wines in the late 1950s and officially launched AV in 1962. Eric Leber recalls helping to plant AV’s first vineyard on Harrison Hill near the Yakima Valley town of Sunnyside in 1962 when he as a young teen. 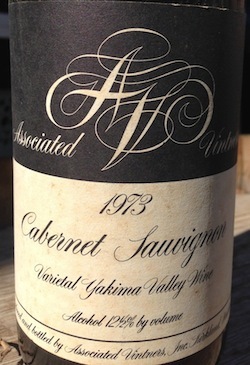 Through the years, AV evolved, changing its name to Columbia Winery in the late 1970s with the arrival of David Lake, who was its winemaker for decades. Today, Columbia Winery is owned by Gallo. Eric Leber became a professor of organic chemistry and taught at Heritage University in Toppenish. This led him to explore the idea of squeezing oil out of wine grape seeds. In 2007, Leber and Ramonas – who met as students at Yale University – launched AprèsVin as a retirement project of sorts. They view the business as not only a way to create gourmet local products but also to serve as environmental stewards. In the early days of the business, the couple would get the seeds – along with gooey grape skins and other byproducts of crushed grapes – and would have to figure out how to separate, clean and dry the seeds. Today, they have the process down pat, thanks to the help of FruitSmart, a processor that takes the crushed grapes delivered by the wineries, then removes and dries the seeds. It’s all done in the tiny community of Whitstran, which is north of the Yakima River, not far from Prosser. The grape skins are then returned to the wineries, where they can be used as organic fertilizer in vineyards. They also might go to composting operations or dairies where they will be used as cattle feed. In other words, every bit of that waste is used. And that goes for the tiny seeds. Once the process is complete, there is no hurry to press the oil from the seeds. In fact, Leber and Ramonas store them in totes until they are needed. This year, they will make about 3,000 gallons of grape seed oil. To produce that much, they must use about 400,000 pounds of wine grape seeds. That seems like a lot, but the couple point out that they bring in perhaps 3 percent of the available seeds produced by the Washington wine industry. “There’s a lot of resources that presently we don’t use,” Leber said. Washington grows more than 40 wine grape varieties, from Aligoté to Zinfandel. But AprèsVin uses Washington’s “big four” varieties: Chardonnay, Riesling, Cabernet Sauvignon and Merlot. These four varieties make up about 80 percent of Washington’s wine grape production. Interestingly, they all exhibit different flavors when their oils are extracted, Ramonas and Leber said. Riesling grape seed oil is the lightest, with green, grassy notes and just a hint of citrus. Chardonnay oil is rich, round and buttery with a bit of hazelnut and toasty notes. The seeds for both of these oils come from grapes before the wine is fermented. However, Merlot and Cabernet Sauvignon seeds and skins are left in the wine grape juice during fermentation to pull out color and flavor, primarily from the skins. As such, the seeds also go through fermentation. Leber said that while their Merlot and Cab oils don’t have alcohol, they do have as many as 50 different aromas and flavors imparted during the chemical process of fermentation. The Cabernet Sauvignon oil is bursting with a variety of fruit flavors, while the Merlot oil is the most complex of the four varieties, revealing chocolate and umami notes. 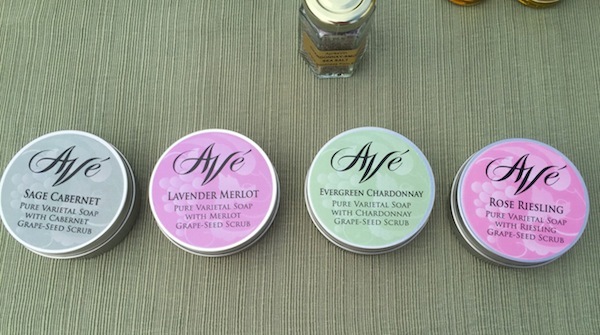 AprèsVin also has created a line of infused oils, including Garlic Chardonnay, Lime Riesling and Chipotle Merlot. Leber and Ramonas have noticed stark differences in oils depending on how warm or cool the year is. In wine, this is called vintage variation. And it seems to happen in the oils, too: A cool year will be much different than a warm year. Additionally, seeds from grapes picked early in the season (in August this year) produce different flavors than the same variety picked, say, in October. In other words, hang time affects grape seed oil, too. 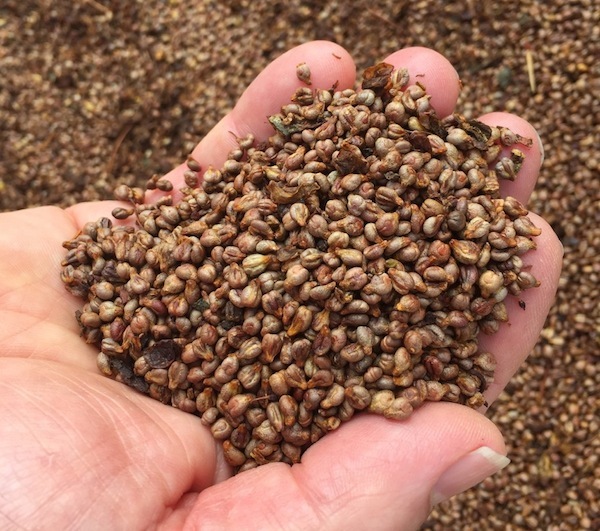 The oil is only about 10 percent of a seed’s content, so AprèsVin takes the other 90 percent – which at this point is a dry solid – and mills it into a highly nutritious and gluten-free flour. Leber and Ramonas keep the varieties separate, so customers can actually buy Merlot, Cab, Riesling and Chardonnay grape seed flours. These flours can be used in baking, sauces, soups and stews. Working with a small company in the coastal town of Oysterville, Wash., AprèsVin also produces artisan soaps using grape seed oils and fibers. They make four different soaps, again separated by variety. If that isn’t enough, they also produce a Chardonnay smoked sea salt using Chardonnay vines that have been sent through a chipper. They percolate the smoke through sea salt, creating an incredibly delicious product. They also will bubble the smoke through Chardonnay oil, which creates a beautiful smoked oil. Leber sees part of his legacy – as the son of one of the wine industry’s founders – as environmental, to help make wine production more sustainable. Not only that, but AprèsVin also is creating products that are healthy. Grape seed oils have higher smoke points than olive oils, so they can be heated up to 100 degrees higher than olive oils before they start to burn. They are loaded with vitamin E, antioxidants and phytonutrients. They also are extremely shelf-stable. While olive oils are best when used six months to a year after being pressed, grape seed oils can easily last twice that long. And while olives must be pressed soon after harvest, grape seeds can be stored for a couple of years before they are used (AprèsVin has too much demand for its oils to hold the seeds for long, though). And thanks to a company called Oil & Vinegar, AprèsVin oils are available across North America. This has turned the couple’s small retirement project into a pretty big operation. 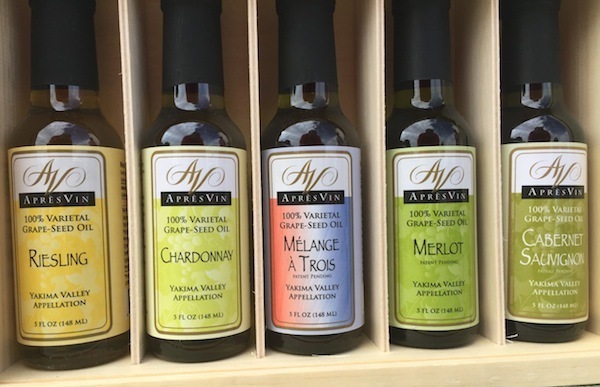 In the Northwest, AprèsVin oils are available at Oil & Vinegar stores at Bellevue Square, Clackamas Town Center south of Portland and River Park Square in Spokane. Oil & Vinegar also has stores along the Eastern Seaboard, in the Southwest and four locations in Canada. A few wineries and specialty food stores also carry AprèsVin products, including DavenLore Winery in Prosser. The products also have caught the attention of Seattle-area chefs. 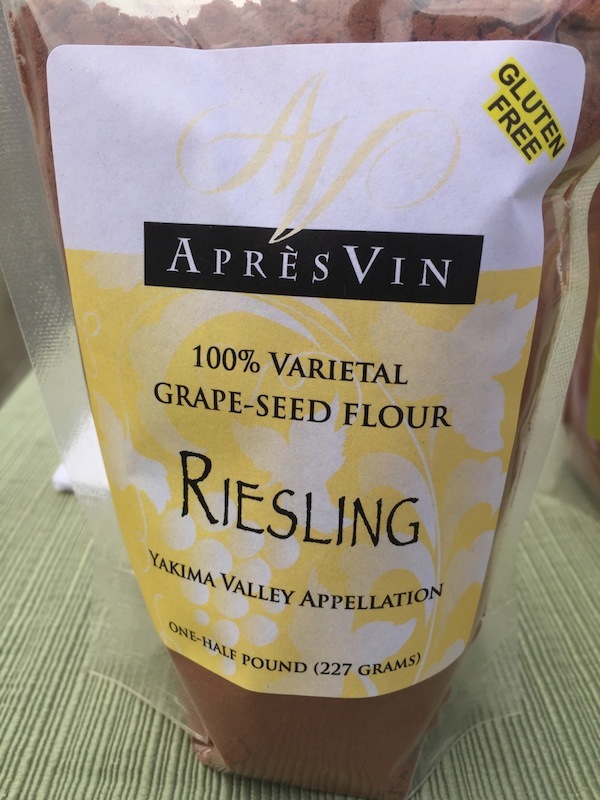 PROSSER -- Eric Leber and his wife, Lori Ramonas, are squeezing a new gourmet product out of the area’s wine grape industry. 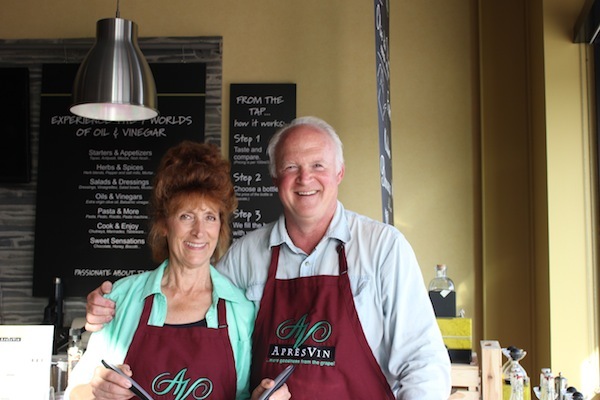 The West Richland couple is extracting the oil from varietal wine grapes, infusing some with lime, chipotle or French herbs and bottling them through their new business, AprèsVin. Leber, a former chemistry professor at Heritage University in Toppenish, challenged his students several years ago to uncover as many uses as possible for the agriculture waste left over from the area's growing wine industry. "They came up with 42 different products -- paper, creams, biofuels..." he said. An enterprising Northwest couple is striking oil in other people's garbage. The garbage in this case is the tons and tons of crushed stems, skins and grape seeds generated by our region's booming wine industry. Correspondent Tom Banse reports from Prosser on the value that might hide in those winemaking leftovers. The best way to explain this might be to start where I started... at an oil tasting. That's kind of like a wine tasting, but with breadcubes and little cups of flavored oils. Kennewick -- The number of wineries in the area continues to multiply, but with the wine-making process comes a dilemma. In the last five to six years, Dr. Eric Leber, a semi- retired chemist from the Tri-Cities, has come up with 50 different products that can be made from the by-products of wine making. Among those: varietal grape-seed oils, flour for baking, soaps, and skin lotions. Those are the more tame of the solutions he has engineered. February 16, 2010 - AprèsVin was one of six companies selected to receive the 2010 Entrepreneurial Award which is a program jointly sponsored by the Richland Rotary Club, Pacific Northwest National Laboratory, Tri-City Industrial Development Council (TRIDEC), and Port of Benton. The program was instituted in 1997 to recognize the importance of entrepreneurial spirit in the community for future economic diversification. The Awards spotlight businesses in Benton and Franklin Counties that show exceptional promise for the future. Nominations for the awards came from three community-based organizations involved in entrepreneurial support programs. AprèsVin was nominated for the Award by TRIDEC. The Award was presented to Drs. Eric Leber and Lori Ramonas, Co-Founders of AprèsVin, at a special ceremony during the February 16th meeting of the Rotary Club. September 23, 2010 – AprèsVin was recognized by the Seattle Business magazine as a leading Washington company that employs exemplary recycling and reuse practices at the magazine’s fourth annual Green Washington Awards Banquet which was held on September 23rd in Seattle. The Awards Program was established to recognize those companies that are in the forefront of making Washington State a greener place to live and work.